Hammer Film Productions’ heyday spanned the 1950s through the 1970s, with gloriously gothic takes on classic monster stories that starred Christopher Lee, Peter Cushing, and other British stars of the day. Here’s our take on the studio’s best and worst ... though even “bad” Hammer films do have their cheesy merits. Hammer made its first color horror film in 1957, and the color was blood red. A wild-eyed Cushing plays the diabolical Swiss doctor Baron Victor Frankenstein; a melty-faced Lee (who doesn’t really appear in the below trailer) plays the made-from-dead-body-parts monster. Everything about the film—directed by Hammer regular Terence Fisher—is wonderfully theatrical, and fortunately for Hammer and creature-feature devotees, it was a mega-huge hit. Fisher directs a rakish and intense young Oliver Reed—who’d soon go on to become one of cinema’s most legendary hellraisers—in Hammer’s 1961 take on the moon-crazed beast. Two years before George A. Romero terrorized the Pennsylvania countryside with the living dead, Hammer unleashed same on the spooky English moors, circa Victorian times. Witchcraft! Voodoo! Fox hunting? Yes! An essential not just for Hammer fans, but zombie completists, too. Released stateside with the even-more-evocative title Five Million Years to Earth, 1967’s Quatermass and the Pit was the third in a series based on a BBC TV show also called Quatermass and the Pit. It’s the most science fiction-leaning entry on this list, and is about the discovery of an ancient alien race who’re still highly capable of wreaking mad havoc among humankind. Hellish havoc, you might even say. Another Fisher-Cushing-Lee collaboration, this 1958 thriller followed up on The Curse of Frankenstein’s success with another classic monster. (“Horror of” was added to the title in America to make sure Bela Lugosi fans knew which version they were getting.) Lee plays the Count; Cushing plays his nemesis, Van Helsing; and a youngish Michael “Alfred Pennyworth” Gough plays a man whose wife and sister-in-law are threatened by you-know-who’s fondness for fine young throats. Hammer’s twist-filled, 1961 black-and-white thriller features Christopher Lee in a supporting role, but the main focus is American star Susan Strasberg, who’s great as a young, rich, wheelchair-bound woman who may or may not be slowing losing her mind. Fisher directs Lee again, but this time it’s from a script by Richard Matheson (adapted from Dennis Wheatley’s novel). And the evil monster here is the big daddy of ’em all, with the most photogenic cult of followers, too: SATAN! 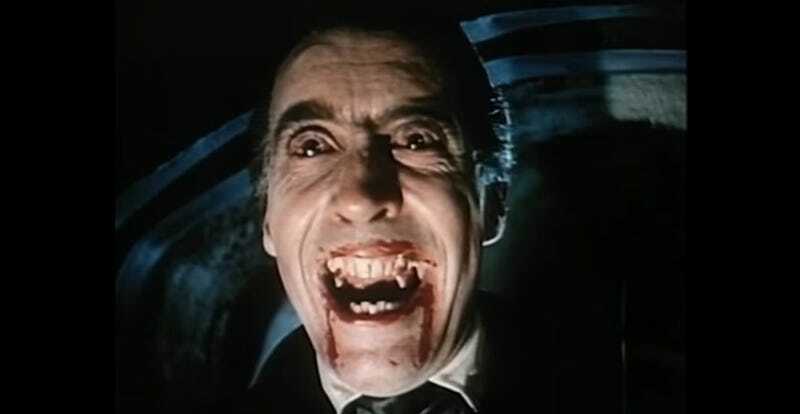 Hammer’s final Dracula movie (which stars Cushing as Van Helsing, but not Lee, who’d given up his fangs in 1973 for reasons we’ll explain below) came out in 1974. It was a collaboration with Hong Kong’s Shaw Brothers Studio, and at the time, the mash-up of vampires and martial arts might have confused audiences and critics a bit. But in today’s currency, that combo spells cult movie gold. As in Golden Vampires. The first of the “Karnstein Trilogy,” this titillating 1970 entry takes its tale from the 1872 novella Carmilla, one of the earliest works of vampire fiction. Peter Cushing co-stars (although not, in this different setting, as Van Helsing), but the picture belongs to Ingrid Pitt, who plays Marcilla/Carmilla, the seductive vamp who (scandalously, in 1970) plucks female victims—though really, she’ll take down anyone who gets in her way. When scientist Dr. Jekyll (Ralph Bates) transforms, he becomes the super-hot and sinister Sister Hyde (Martine Beswick)! That concept along would be amazing enough, but this winning 1971 film also manages to get Jack the Ripper and body-snatching duo Burke and Hare into the story, too. Here we have two films that dared to wonder what would happen if Cushing’s Van Helsing and Lee’s Dracula existed not in Victorian England, but in early-1970s swingin’ London. The two films are linked in setting and with similar characters ... and also by not being very good movies—especially when compared to the stellar filmography that preceded them. After Satanic Rites, an over-it Lee hung up his cape, ending his 15-year reign as Hammer’s go-to vampire.